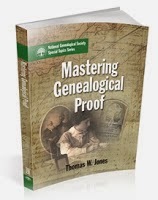 Here is your chance to study the book Mastering Genealogical Proof by Thomas W. Jones with a group of genealogists and discuss the concepts with a mentor. Below is an announcement from Michelle Goodrum, the administrator of the Gen Proof Study Groups. Thanks to an arrangement with the ProGen Study Program, we are now offering Gen Proof Study Groups through the Basecamp project management website. Registration is now open for two groups beginning in April. Please read on for additional information. The Gen Proof study groups are organized to study the book Mastering Genealogical Proof, by Thomas W. Jones. This is an exceptional textbook detailing the application of the Genealogical Proof Standard (GPS). The exercises will help you develop the skills you need to be comfortable applying the GPS to your genealogy work. This study program will consist of small groups of 10-20 members and a mentor who will guide the discussions and answer questions. Thanks to an arrangement with the ProGen Study Program, the Gen Proof Study Groups now have the opportunity to use Basecamp as a platform. Basecamp is a project management platform. It is the same platform used for the ProGen Study Groups so some of you are already familiar with it. • Asynchronous discussion (Group 40)-- The group will not meet at a designated time but have ongoing discussions throughout the week. The mentor will log on each day to answer questions and highlight certain concepts, and participants should check in daily also. • Text chats (Group 41) – This group will meet on Friday evenings in a chat room for a live chat. Discussions can also take place throughout the week. • Frequency – Both groups will meet every week for eight weeks. Please be sure you have time to read the chapter and complete all of the exercises (these may take you several hours) BEFORE each of your group discussions. Since these groups cover one chapter per week, it will be very fast paced. So you should plan on studying and participating for about 10-15 hours per week. Are you thinking of attending the National Genealogical Society conference in May? If you you may want to make your decision before the early bird discount ends on March 30th. It looks like an excellent program. See the press release below for details. I will be unable to attend the conference in person this year, but will be participating in the live streaming events. See my post on NGS Conference to Live Stream Two Tracks. Arlington, VA, 23 March 2015—If you are planning to register for the NGS Family History Conference in St. Charles, be sure to take advantage of its early bird discount. The discount, as well as the opportunity to order a printed syllabus, ends 30 March 2015. After that date, the NGS member price will increase from $195 to $230 for all four days, the non-NGS member price will increase from $230 to $265, and the syllabus will only be available as a flash drive. This year’s conference features more than 25 tracks and 150 lectures, as well as social events, luncheons, and the NGS banquet. It is a great opportunity to network with other genealogists and enhance your knowledge. The conference will be held at the St. Charles Convention Center and will run from 13-16 May. For conference information and to register, go to the 2015 NGS Family History Conference. The NGS Banquet is another event not to be missed! Registration for all meals and social events closes on 29 April 2015. Tickets for social events will not be sold on-site. Be sure to sign up as quickly as possible. The StLGS Host Event BBQ is $39; luncheons are $21; and the banquet is $38. Menus are in the registration brochure. On Tuesday afternoon 12 May 2015, many Missouri genealogical and historical societies will be available in the St. CharlesConvention Center from 1:00 p.m. until 5:00 p.m. to answer questions about local repositories and resources, discuss their group’s activities, and sell their publications. There’s still time to sign up for several exciting tours on Tuesday, 12 May 2015, prior to the NGS Family History Conference. For more information, please see St. Charles Area Tours. Registration for the tours closes on 29 April 2015. We hope to see you in St. Charles in May! Are you interested in a career in professional genealogy? One of the best resources available in the field is the Professional Management Conference (PMC) hosted by the Association of Professional Genealogists (APG). If you missed the conference in January, then you can still benefit by purchasing the conference syllabus. APG is making the syllabus available as an electronic download for only $18. I have purchased the APG PMC syllabus every year for the last five years to enhance my own professional genealogy education. The 120 page syllabus contains the speakers' handouts from all 16 sessions detailed below. You do not need to be a member of APG to purchase the syllabus, which is available on the APG website at https://www.apgen.org/catalog/products.html. The Illinois State Genealogical Society is hosting a webinar series that is free to the public to join in the live presentations. The recorded presentations are available to ISGS members. They have a great lineup of speakers and topics for 2015. To register visit their webinar registration page. Description: More accessible than ever, City Directories can fill in blanks between census years, opening new chapters in your family history research. Learn how to find, navigate, and cite this valuable record source. Description: Genealogy is more than just finding ancestors and other relatives to create a giant family tree. In this talk you will learn the basics of 'Family Systems Theory', the same technique used by psychologists, marriage and family therapists, and social workers to help their clients understand themselves better. By understanding our ancestors through 'Family Systems Theory', you'll be able to understand family dynamics through multiple generations and your relative's impact on the family 'system' and how the system affected you. These tracks include some of my favorite presenters, including Elizabeth Shown Mills, Thomas W. Jones, Warren Bittner, John Colletta, David Rencher, Julie Miller, Alison Hare, Angie Bush, Michael Ramage, and Jeanne Bloom. These two tracks can be viewed in real time, or later at your convenience over the next three months. You can register for the live streaming sessions on the NGS website. In the past when I have missed and NGS conference I have ordered copies of some of the lectures on CD. While this option is still available, and I may order CDs of some of the lectures not available on the live streaming, I am excited to be able to see the video of the presenter and his/her slides, rather than just hear the audio. For NGS members you can purchase both of the live streaming tracks for $115. This is a great deal as it is about the same price as ordering the ten lectures on CD. As immigration legislation in the United States became more restrictive, the information on passenger-ship records became more robust. This lecture will examine naturalizations in the United States. It will discuss the naturalization process, records that were generated, and how to locate them. Three 19th-century case studies demonstrate the original records and published materials available to discover the particular facts of each immigrant ancestor’s story. German localities are tricky as many towns share similar names, or the name has changed, or the place no longer exists. Learn to find localities. Lacking a location in Ireland to begin research may necessitate learning to use the sources and methodologies for solving the problem with Irish resources. Join us for day two, which includes learning methodology techniques for use with historical context, forensic genealogy, DNA, and problem solving using a combination of resources. A cholera epidemic in London, England, in 1854 is the backdrop for a memorable lesson in how to develop historical context. Can you really “prove” a maternal line when, for four straight generations, absolutely no document identifies a parent or sibling? This session shows you how. Learn how a $22 million estate case involving same name/age/place ancestors was solved using the Genealogical Proof Standard. Using DNA testing as part of an exhaustive search in conjunction with traditional records can provide new evidence to answer genealogical questions. You can register for the live streaming sessions on the NGS website. I am excited to be speaking at the Washington D.C. Family History Conference on Saturday, May 2nd. I will be addressing the Genealogical Proof Standard in a two-hour interactive class. This session will be a discussion of the five elements of the Genealogical Proof Standard, including thorough research, source citations, evidence analysis, conflict resolution, and a written conclusion. We will cover what each of these elements looks like in practice, and demonstrate the concepts with real genealogical cases.